I am over the moon excited!! 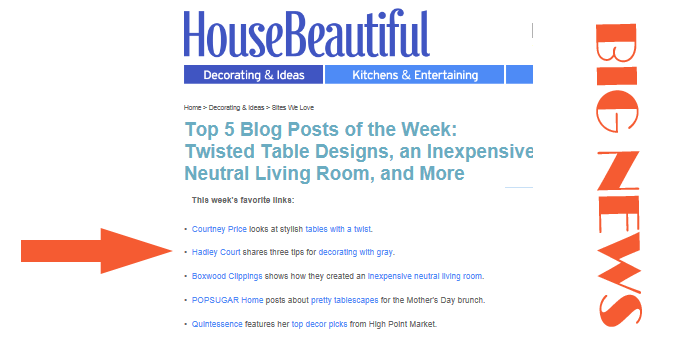 Hadley Court was listed in “House Beautiful’s Top 5 Blog Posts of the Week.” Someone please pinch me. I am so grateful to House Beautiful for including Hadley Court. I have always been a big fan of House Beautiful. If you recall my blog post about the Design Bloggers Conference, I had the privilege of hearing Newell Turner speak. I was fascinated to hear the vision Newell Turner has for the future of House Beautiful and the marriage of print and digital media. House Beautiful is a pioneer in the new media world and I look forward to seeing the innovations they have in store for us to enjoy. So exciting – congratulations on a well deserved honor and you’re in great company – love the other blogs too!